Animal lovers of all ages get excited when they meet a new pet or playmate, and children in particular can show their excitement with great enthusiasm. Unfortunately, many older animals come out a little worse for the wear when they are “well loved” by a child. To avoid anything untoward happening to older animals, remind children to play gently, give older animals lots of time and space, to let adults know if an animal has an accident, to let adults know if they feel any lumps or bumps on the animal, and to stay away from all medications intended for the animal. Like people, animals become more fragile as they age. They begin to slow down, many put on weight, and even their personalities can become a little sharper – or a little softer – then they were when they were younger. Hearing and sight may deteriorate, inner organs may be affected and bones can soften. 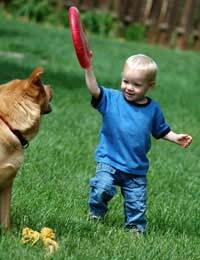 Let children know all of these things so that they understand why they can not play roughly with older animals – for example wrestling with them or making them jump or fetch – and indeed why more gentle play is for the best. Kids who understand why they need to do it are usually more likely to remember to play gently at all times. Older animals are often much slower than they were when they were young, and often they can seem frustrated with their new speeds. Children should be advised to give older animals plenty of time and space when they are attempting to do something and to offer help only if it looks like an animal needs it. Due to limited speed and agility, older accidents can seem clumsier than younger animals. If an older animal has an accident, such as knocks into something, pushed something over or breaks something, a child should tell an adult right away. Older animals may also have accidents involving their own urine or faeces. It should be explained to children that this might happen – even if an animal was house broken years ago – and that they should let an adult know when it does. Correspondingly, children should be taught never to touch animal urine or faeces for any reason. Children are often inspired to hug their animals or otherwise come into close contact with them, so they may well be the first people to know if an animal is sporting a new or different lump or bump. Children should be told that this might happen, and that they are to tell an adult immediately if they feel something unusual on their animal. As such a lump or bump might indicate illness or disease, early detection is important. Many older animals are prescribed medications for illnesses, diseases, conditions or even to manage pain. Like any prescription medicine, these should be kept out of the reach of children. It should also be explained to children that these medicines help keep their older animals alive, and that they should never, ever be taken by a human. Explaining that this medicine could make humans very sick is also a good idea so that children understand why they are not to touch an animal’s medication. Older animals are often fragile beings, and children should be taught to interact gently and patiently with them. With the right approach, both the child and older animal should share many happy memories.